Essays written by Alexander Gallé between January 2011 and September 2012. Visit the Gallé Design Studio website. → The garden and the gardener. → The pretence of knowledge. → Government is a product. → Frying small fish for lunch. → Tying knots in a rope. → From dotcom to dotgov. → The Tao of nations. → Thoughts on Bastille Day. → Beyond democracy: designing human interaction systems. → From seed to plant. ↑ Return to the contents list. These essays are not a manifesto, aimed to get you to vote for one party or the other at the next elections. I am not trying to convert anyone, or looking to sell anyone some brand of pre-formatted, new and improved politics. Neither "left wing" nor "right wing" politics are advocated in them. In fact, one of the very few certainties I have is that advocates of both "wings" are equally responsible for limiting themselves to a political framework that has, over the centuries, failed to provide anything but the most immoral, ill-conceived and ultimately destructive solutions to the problems individuals face all over the world. Individuals who - searching for peace, prosperity, liberty and happiness - end up finding war, misery, arbitrary restraint and frustration. These essays are not about politics, and yet the subjects they cover are, today, still mostly thought of as political subjects. That very premise is the first thing I aim to challenge, to depoliticise so-called political subjects and approach them from a design perspective instead, borrowing theories and views from product design, from architecture, from systems, web and interaction design. 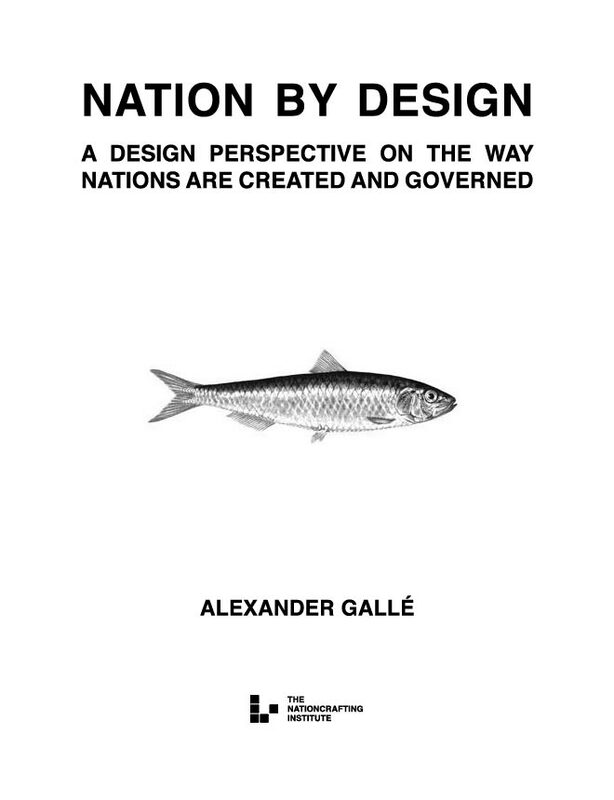 These essays are an invitation to look at the nation's functionality itself, which most of us take almost for granted, to apply design theory to the way nations are governed, and to ask the following questions. If we had a blank canvas to start a new nation, how would we go about designing it? How could we design it so that it isn't just good now, but would contain within itself the seeds of its own evolution? What would we simply do away with, leaving to others what they do best and focusing on our own irreplaceable qualities? How could it best interface with its users, providing the best user experience? Aside from this hypothetical new nation's design properties, we will also ask ourselves how we can improve the way in which new nation prototypes are created, how to bring them and the solutions they offer to citizens that are dissatisfied with the services offered by their current nation-services suppliers, thereby increasing customer choice in the "market of nations" which today consists of some 250 states, each of which currently benefits from a monopoly status as the single provider of nation-services in a particular geographical area. This latter aspect may, at first hand, appear rather odd in a design-oriented book. It is, after all, more to do with market economics, and designers do not often interact with economists. The two areas of study are kept very much apart from high school on, attracting very different kinds of people. And yet, the more you think about it, the more this separation seems to be very odd indeed: much of what economists study is really just systems design applied to human interaction. With this mindset, we will study the system in which a variety of suppliers bring to the market different nation designs. The experience will shed new light on the current functioning of government, the individual's relationship with it and, hopefully, highlight opportunities for design improvement. The Garden and the Gardener. Let's start this essay by considering various types of garden design. If you look at European gardens, and at Italian and French formal garden designs of the Enlightenment period in particular, the position of the gardener in relation to the garden is clear: the gardener is a force competing against nature, taming nature and forcing his geometric designs upon the garden. The gardens of Europe's palaces look like small cities made of grass, plants and trees. In Japanese gardens, on the other hand, the gardener sees himself as a part of nature. He is, as it were, another plant, albeit one with no roots in the ground, and with the intelligence to influence the balance of the garden as a whole. His culture is not distinct from nature, it is a part of nature, just as the ability to grow flowers and live out a symbiotic relationship with bees is part of nature. As a result of this difference in outlook, many Japanese gardens are naturally harmonious, created with a deep knowledge of how plants grow naturally, and working with this natural growth, rather than against it. Over the long term, they're not trying to break out of the shape they've been designed in, because the shape already took their growth into consideration. Just as it is easier for a woodcutter to cut a piece of wood going along the grain than against it, so it is easier for a gardener who understands each plant's growth pattern to bring out the emergent harmony of the garden. Japanese gardens make gardening look easy: they look as if they just grow themselves. Some Japanese gardens designed during the Edo period are still growing today in the way they were designed to grow, with garden maintenance seen as a complementary action, for example, to plant seeds being blown by the wind. This difference in relationship between garden and gardener is fundamental when considering the vast ecology that is a nation. The "European garden" type of state assumes that the nation itself is a chaotic entity that must be tamed and subjected to various forms of pressure in order to ressemble anything like an 'ordered' garden. The "Japanese garden" type of nation design, on the other hand, works with the nation's intrinsic growth properties. It's interesting to see that many of our ideas around the nation state originated roughly at the time of the Enlightenment, the age when our gardens started taking on the shape of cities, straight and square. Many of our constitutions have changed only superficially since then. The central and all-encompassing role of the state in France, for example, hasn't been questioned much since the days of the Enlightenment, which is why we still constantly see politicians of all parties behaving like dictatorial gardeners hectoring their gardens into shape. What they seem not to realise is that - in our nation/garden metaphor - it's the plants themselves we're supposed to be designing our gardens for. In the context of my last essay, here is an extract from Friedrich Hayek's Nobel Memorial Prize lecture (1974). "If man is not to do more harm than good in his efforts to improve the social order, he will have to learn that in this, as in all other fields where essential complexity of an organized kind prevails, he cannot acquire the full knowledge which would make mastery of the events possible. There is danger in the exuberant feeling of ever growing power which the advance of the physical sciences has engendered and which tempts man to try, "dizzy with success" - to use a characteristic phrase of early communism - to subject not only our natural but also our human environment to the control of a human will. The recognition of the insuperable limits to his knowledge ought indeed to teach the student of society a lesson of humility which should guard him against becoming an accomplice in men's fatal striving to control society - a striving which makes him not only a tyrant over his fellows, but which may well make him the destroyer of a civilization which no brain has designed but which has grown from the free efforts of millions of individuals." What does nationcrafting - crafting a nation - mean? Nationcrafting means: leaving behind politics and ideological preconceptions, and looking at government as a designed product instead.. This means government can be designed, created, modified, re-modified, discontinued, re-launched with new features, or discarded features, or absorbed partly or completely into other products with similar functionalities, etc. I use the word "product" in a very broad sense of the word, not just what comes under the usual category of "product design" in design school. So, we're not just comparing government to cars and cellphones, but also to price comparison websites, to rent-a-car services, to phone service providers, to online music providers. I also use the word "nation" rather than, say, "state", because the state and the institutions we associate with it are just one of the ways one could go about providing the services people expect from a nation. The point is not to look within the framework of what already exists - the state - but about identifying better alternatives to the way things have been done until now i.e. possible alternatives that would improve on the very idea of state itself. Now, some products come with a wide range of different features, in order to satisfy not just a wide variety of users, but to position themselves as the one-stop-shop in a particular product category. Other products tend to focus on just one key feature instead, but aim to be the best in that feature's category. Correspondingly, some products are very empowering and customisable, but complicated to use, whilst others just do everything in the background and are extremely user-friendly and pleasant to interact with. Sometimes, technological changes and market dynamics have a very profound effect on these variables, redefining the scope of our interaction with the product and with the world. For example, the mobile phone used to be just a tool for telephoning and texting our friends and colleagues i.e. a single-feature product. Today, however, it has evolved into the smartphone, a power-object which has seen its physical keys give way to the more flexible space that is the touchscreen interface, in order to enable us to interact with countless applications that allow us to do everything from taking and sharing pictures to comparing and purchasing plane fares. Moreover, it is soon to become our gateway into augmented reality, that is, a juxtaposed view of the physical world around us with the data that corresponds to it on the internet. Given such an evolution, it is then only natural to reconsider the type of service providers we want to supply us with such widely divergent services, and the nature of our contract with them. The telecoms sector is a very good example to study in further depth. Not so long ago, all possible types of telecommunications were provided by one single supplier. In most countries, both hardware and software were supplied by one national company, which was given a monopoly status by the state over its geographical area: the British were supplied by British Telecom, the French by PTT, the Germans by Deutsche Bundespost Telekom and the Italians by the Società Italiana per l'Esercizio Telefonico. In many countries, the key reason for this was a belief that state subsidies were necessary to make telephonic services accessible to all citizens, regardless of their personal income. Another reason may simply be a lack of intellectual depth: telephone wires are after all, cables linking different points in a geographical sense, but it takes a bit of out-of-the-box thinking to arrive at the conclusion that, once geographical points are connected, the very function of telephony is to enable citizens within different geographic areas to live and conduct business regardless of geographic limitations, to transcend geography. Two evolutionary steps have been taken since then. Step 1: other, non-state run, companies started to provide the same telecoms services, improve on them and offer them at rapidly decreasing cost, making a networked data platform both possible and affordable. The outcome for the telecoms sector itself is plain to see: twenty five years later, companies like Skype started offering video calls to and from anywhere on the planet entirely free of charge. The arbitrary relationship between providers and geographical location has also been broken: today, it is not uncommon for different people in the same household to be supplied by different phone service providers, interacting seamlessly with one another, each choosing a different contract with a provider that suits them best, or even choosing to have no contract at all, on a pay-as-you-go system. Step 2: providers of all kinds of goods and services started to operate on the data platform, which includes every company with a website today. Now, just as it is unlikely that our picture sharing service and price comparison service would be best supplied by the same online provider, so it is unlikely that - given a free choice - the current nation-services provider we call the state would be our preferred choice in all of the sectors it currently monopolises. It is also quite likely that liberating some of those sectors would be at least as fructiferous as the liberation of the telecoms sector. What "killer apps" would evolve over the next 25 years? What would a Skype-like business model look like for other sectors that are equally affected by knowledge and technological improvements, such as the health sector or the education sector? What would School 2.0 and Health 2.0 look like? Most people, when you talk about design, think first of all about aesthetics, then about the idea of a relationship between aesthetics and functionality, between form and function. Within this context, you will generally find two sides. The first side will advocate that design fulfills some kind of emotional role. The concept of "Emotional Design" was analysed in depth by Donald Norman, who put forward the idea that humans primarily form an emotional connection with the world, that emotions are the primary channels through which we understand the word, and that it is those emotions which are later rationalised. Therefore, to create objects humans can understand and connect to with some kind of immediacy, we must above all create objects that are sensual, beautiful, emotionally and aesthetically pleasing. The cover of Norman's book shows off Philippe Starck's lemon juicer in all its glory. The second side will advocate that form follows function, that the criteria for how things should look are some kind of aesthetic parallel to how they function. This latter approach is perhaps best exemplified in the Bauhaus chessboard, designed by Josef Hartwig. In this chessboard, every piece is designed to correspond to its way of moving on the board. The knight - which always moves in two separate, perpendicular directions - is designed as two perpendicular blocks, reminding the user of this move. The bishop, which always slides diagonally, is designed with a diagonal cross on top. The pawns, which only move forward one square at a time, are presented as small cubes, etc. There is a third approach to design, which is much less talked about, and even less actually seen. That's because it is invisible. Or, rather, it is so well tuned into how you live your own life, that you don't even notice it's there while you interact with it. The experience is invisible because it is just part of the fabric of your own reality. Consider, for example, your interaction with human-generated light. Light is turned on by flicking a light switch next to the door as you walk into a room. The light fills the room immediately, and you go about your business in the room. When a lightswitch or lightbulb stop working, or when the electricity supply stops, that is the moment when we become aware of the actual lighting system in the house. Similarly, air conditioning works in the background while we go about our business, mostly unaware that it is working. When it stops working properly, we complain about the heat, or we complain about the fans being too loud. That is when we notice the aircon system: when it stops working. Possibly the best way to witness invisible design is by analysing good film editing. Viewers are often surprised when you ask them to alert you everytime a cut happens in a film: the average shot is about 3 to 5 seconds, depending on a film's pacing, yet when we watch a film, following its chain of thoughts, we are mostly unaware of the cuts between shots actually taking place. A dialogue between two characters is interspersed with listening shots, reaction shots, characters are shown from further away in the beginning and we cut into close-up shots later on, etc. Yet the overall effect is of a smooth, perfectly believable dialogue: the cuts are invisible. In fact, most of the storytelling tools used in cinematography are fine-tuned to a point of invisibility: the viewers are so enchanted into the story being told that they suspend their awareness that this is a movie, and let the content hijack their own chain of thoughts. People come out of movies having laughed and cried, having liked or even loved certain characters and hated others. Considering their secondary nature, movies are really a very transformative experience. Much of that transformative power comes from the fact that so much effort has been put into making the medium itself disappear, thereby raising the secondary experience to the perceptual and mnemonic status of a first-hand experience. Another great place to witness invisible design is on the web, perhaps even more so because the viewer is turned into a user, an interaction takes place that puts it in the same design family as product and architecture design. Steve Krug, who wrote the book "Don't make me think", advocates the idea that the best online interaction is the one you just don't notice, the one that is designed in such a way that you interact without having to think about the interaction itself. This can be seen in even the smallest things, for example, when a shopping cart offers you the option to continue along a particular path, or go back to change something: the confirmation has to be on the right, the "going back" on the left, because the former is about taking a step in the future, the latter about correcting something that was done in the past. Similar to the broken aircon system, it's when the online experience frustrates us that we pay attention to its idiosyncracies. Online users mostly just want to do what they want to do, without having to negociate the actual workings of the website. Usability theory is based on this, and usability testing is primarily about getting users to do certain tasks on a website (say, booking a flight, or finding out something) while saying out loud what it is they're doing - or trying to do - during their interaction. In the context of nationcrafting or nation design, the first two themes - emotional and functional design - are very enlightening. The first - the emotional approach to design - is particularly important in the field of nation branding, the "big idea" citizens buy into on an emotional level when they feel a connection with their nation. Typically, this is the nation state's attempt - more or less successfully - at identifying its institutions with the smaller communities the citizens were born into, or the ones they were immersed in during their childhood, or the ones they feel a personal connection to because of personal values. Italy is a great case study for this, as many Italians today still feel a closer emotional connection to their city (which would have likely once been a city-state in its own right) than they do to the concept of Italy. I'll get back to this in a separate essay on nation branding. Benedict Anderson defines the nation state as an "Imagined Community", putting forward the idea that a modern nation is different from an actual community because it is not and cannot be based on everyday face-to-face interaction between its members. The mental, emotional image of the nation state members hold in their minds is the product of broadcast (i.e. one-to-many) secondary experiences, mediated through TV and newspapers as well as constructed events such as international football matches, rather than shared (i.e. many-to-many) cultural experiences. The creation of nation states as imagined communities is made possible by the ascent of the print and broadcast media. It therefore stands to reason that the loss of relevance of the print and broadcast media in comparison to multi-user interaction and shared information will cause an erosion in the relevance of the nation state as we know it, in favour of nation models that are made possible by the ascent of multi-user, interactive and shared mediatic experiences. The second - the functional approach to design - opens up interesting questions regarding the way we switch the management of state institutions. Consider, for example, the Bauhaus chessboard mentioned earlier. The connection that exists between its form and function is not something that can be improved on by alternating the people in charge and changing the brief, following an election every five years. The essence of the product is such that it cannot be improved by, say, decorating the chess pieces with highly ornate designs: it would be just, well, missing the point... The design can, of course, be improved, but only by taking its approach further, by exploring ways in which form and function are more tightly connected. This applies to nations, too, the difference being that you can always buy another chessboard and choose to play one today and the other tomorrow. The same cannot be said for your nation services provider. However, it is the third approach to design - the invisible approach to design - which reveals the critical difference between politics on the one hand, and good nation design on the other: politics - the group of services provided by the nation service provider - is today very, very visible. Every day, we read the news to find out how some political issue has failed us, how some politician has been less than honest about his business, how another war has been declared which nobody wanted, fought with weapons that were somehow sold to the very country the nation is now at war with, how an act that should only be of interest between two mutually consenting people is somehow a state committee's business, how the ingestion of a plant's seeds is somehow another state committee's business, etc. In fact, we are constantly made aware of politicians and of the political, they are the opposite of invisible. This, despite the fact that it is actually a sector with relatively little progress: the pace of acceleration is a fraction of what it is in sectors such as computers and telecoms. Not many new states are created, and the ones that are mostly rely on variations of previously designed constitutions to define the rules of interaction between their citizens. The point is this: they are visible and audible because they aren't working properly. If they were working properly, we would be as aware of politics as we are of properly functioning aircon systems. Frying small fish for lunch. to frying small fish for lunch. Too much stirring and lunch is ruined. Tying knots in a rope. What can a designer bring to the business of creating or running a nation? Let's start our enquiry with a relatively abstract, simple visual idea: a knot in a piece of string. We look at the knot and see it as something distinct from the string. In other words, we look at it as a thing, much in the same way that we look at other things: apples, hats and houses. We have names for all these things, and we have a name for a knot. The difference between a knot and other things becomes clearer when you move the knot up and down a piece of string. Some simple knots can be moved along a string quite easily: you put your finger in one of the hoops, and you pull to the side, gently so the knot doesn't get too tight. The knot will move down the string. Depending on the grip of the string, the friction intrinsic in the material it is made of, this movement can be more or less fluid. As the knot moves up and down the string, see how the stuff it's made from - the string itself - just passes through it. Notice also how the knot may move left and right on the string, but no stuff actually moves left and right, only the shape itself of the knot. A knot is, essentially, form. It's a shape within a string. It's just a bunch of string going a particular way so as to look like a separate thing, or separate enough that we should have a separate name for it. The metaphor is this: human institutions are just knots, 'forms' moving up and down the stuff that is human beings. The idea of the nation as an actual thing or object is an illusion. The nation is form, just like all other human associations are form. One of the upshots of this is that - aside from the level of grip and of flexibility within the string itself (levels which actually depend on the individual particles that connect to each other to make up the string) - the shape of the knot is largely independent of the string itself. Similarly, the shape of our institutions is largely independent of the people running them. It is a myth that all you have to do to turn bad state institutions into good ones is to put good people in them. It's not just a case of 'our guys' versus 'their guys' running the show: if the knot itself is the wrong shape, if its shape is unfit for its purpose, then whether the string is made of silk or cotton doesn't change the fact that the same knot needs to be unpicked and redone, or that a new knot needs to be created alongside it. To do that, we need designers. Specifically, we need interaction-aware designers, designers who understand and actively study the interaction between humans and the systems they design. After all, the only really important measure of any design is how people interact with it. Every designer, from architect to automobile designer, is supposed to design with an eye towards the humans who are going to use the product, and yet it is only with the advent of the web that the terms "usability" and "user-centric" became common currency among designers. So, if there's one thing the web has taught designers, it's the idea of "used form": form that is measured and evaluated as it is being used, as the user jumps from one conceptual space to another with, hopefully, as little frustration as possible. Question: how is the user's engagement - or frustration - measured? Answer: by the number of users simply clicking away to another website. For example, the measure which some interaction designers call "site drop": the percentage of people visiting an online shop who add items in their online shopping cart but just don't bother completing their transaction. Under these circumstances, different qualities start emerging from form, such as usability and user flow, the quality of user satisfaction and general happiness to continue with the current interaction or information flow. These are some of the qualities that interest us, as aspiring nation designers, because much of the interaction with the nation (represented by its institutions) is an interaction with entities that are not objects but forms. To go back to the metaphor of the knot: when you interact with a nation's institution, you interact with a knot, a form through which humans pass, more of an idea-thing than an actual thing. The nation's users, the citizens, effectively get to "click" only once every five years or so, during elections. Even then, the options available are not actually options to "click away" to another nation. Users can, of course, "click away" by physically going away, "voting with their feet", moving their person and belongings to another nation. However, this is a costly exercise for most of them: selling their house, gathering objective information about other nations, learning another language, dropping their social network of friends, leaving their families, quitting their job, getting a visa or work permit to work somewhere else, etc. These factors are just some of the reasons why so many humans remain attached, like mussels to a rock, to the same state throughout their lives. They partly explain why, despite the fact that both websites and nations are forms rather than objects, the former are evolving in terms of usability at a very rapid rate, whereas the latter remain mostly stagnant. Until we get to a point where the users of our nations have the option to get out with the same ease they currently have when clicking away to another website, this difference in evolution rate will remain. As a result, of course, the difference between the quality of our online services and the quality of our nations' services will keep on growing. The former will outshine the latter until the point, sometime in the future, when technology enables users to move their person and belongings to another nation at significantly lower cost, both personal and financial. Perhaps, at that point, the relationship between nation and individual will be such that they will not even need to move anything physical, just their data. Any bad nation service providers will then quickly become like a knot without a rope, a ghost of the shape that once was. As nation designers, therefore, our measure of comparison, our Litmus test, will be that of the web, always keeping in mind the option our users will have, in the future, of simply "clicking away" to another nation. For Lao Tse, society obeyed the same laws as the rest of the universe. Deep down, it was run by the same laws that affected the motion of distant planets, the birds in the forest and the fish in the sea, which he called Tao ("the way"). Accordingly, the more statesmen interfered with the natural balance produced and governed by the universal laws, the further away they would get from a harmonious society. When abstract and arbitrary rules were imposed from the outside, struggle was inevitable. The more forcing, the more trouble. For centuries, people in the Far East who are in the business of making things have understood a concept which Taoists call "Wu Wei". This is defined as "working with the way life itself already works", "getting your own self out of the way", "effortless doing" or "doing without doing". Great musical performers "do without doing": they just play and the music comes out just perfect. Get their thoughts, their self, in the way and the music goes wrong. There are many things that you, too, "do without doing": you don't think about making your heart beat, for example, or about which enzymes you should produce to digest the small fish you just ate for lunch. You do not need to learn and remember these actions, your body learns and remembers them for you, so you just "get out of the way". The system is too complex to be dealt with at a conscious level. There are also some actions which you have consciously learned to do, like walking, driving a car or interacting with a properly designed computer interface, which you now "do without doing". The upshot of this is that you can now walk and talk about complex subjects like nationcrafting at the same time. In the words of Nike, you "just do it". Taoists also have a word for a pattern of design that is so complex as to appear, to the untrained eye, like chaos. They call this "Li". Li is the organic flow-pattern of water and fire, Li is the process that shapes the texture of your muscles and the grain in a piece of wood. It's the way things in nature "just do it": how they are born, change, grow and die. You could think of Li as nature's method of "doing without doing". In a nation, there is Li, too. When Frédéric Bastiat and Gustave de Molinari expressed their wonder at the beauty of the free market, the underlying intelligence through which the superorganism that is human society arrives at a natural balance of production and cooperation without any authority telling the individuals within it to produce or cooperate, they were expressing their wonder at the nation's Li, which leads to economic growth and prosperity for humanity just as surely as the free flow of tree sap leads to the shape and structure of the woodgrain that best ensures the growth of our magnificent trees and forests. The interesting thing about Li is that, while its patterns may appear extremely complex, they're actually the result of emergent properties brought about through the interaction of large groups of cells, each cell following extremely simple rules of interaction with a small amount of neighbouring cells. The rule governing the behaviour of each individual cell within the organism is really simple, but the product of all the individual cells interacting with each other is of an entirely different category. That product's beauty emerges out of the multiplicity itself. Not one cell within the organism possesses any kind of power or intellligence to control the organism itself, and yet the outcome appears so surprisingly controlled and balanced that we feel it must hint at some kind of higher intelligence planning the whole thing. That feeling of higher intelligence is the foundation of leadership and government we have had in Europe for the past 2,000 years. In European culture, there is a cell in the organism to whom we have given the power to control the organism itself, and this leader has traditionally been imbued with properties reserved for some kind of god-like being: the Greek word for church is "basilica", which is the house of the "basilis", the king. In the Christian religion, the image of Christ as a king is very common, and many kings have claimed their powers were given to them from a god above, from a perceived "higher intelligence". But the higher intelligence is unnecessary, just as the idea of a leader is unnecessary. The real "leader" is simply the set of properties that exists within each of the individual cells, the higher intelligence is simply the product that emerges from the complexity. It is perhaps better defined as a "meta intelligence", rather than a "higher intelligence". True insight into nationcrafting requires an understanding of this emergent intelligence - call it our Li - to work with the human grain and let the nation grow. Once we get good at that, once we understand it the way a piano player understands the performance so well that his hands remember without his mind having to remind them, then we too can start effortless government, a nation just 'doing without doing'. John Conway, the mathematician, developed a wonderful mathematical game he called "Game of Life" which is an excellent way to understand the concept of meta-intelligence, or emergent intelligence. 1. Any live cell with fewer than two live neighbours dies. 3. Any live cell with more than three live neighbours dies. The rule is repeated, round after round, ad infinitum, so this is a zero-player game once it starts. In other words, the player sets up the game and has no subsequent input in the game's outcome. Very soon, we see patterns emerge and larger shapes "moving" across the grid. Of course, just like the knot in the rope we discussed in earlier essays, no cells actually do any of the moving: intricate shapes are just being translated from cell group to cell group, round after round. You get shapes of just 5 black cells, for example, that "bounce off each other" turning on and off, each round translating the whole shape one cell up and one cell to the right. Conway called those shapes "gliders". You also have what he called "guns": shapes that, as the grid redraws itself round after round, appear to emit gliders on a regular basis. The animation above is one of those. The point is this: all these shapes and patterns exist purely in a kind of meta-reality, that is, a reality that is beyond the one each of the cells inhabits individually. It is worth noting that the individual cells are not wise or enlightened, they do not have any kind of awareness of the collective shapes that are formed. They do not need to be wise or enlightened about the larger shapes in order for the larger shapes to form. The movement we perceive of "glider" shapes passing over the grid, and of "guns" emitting "gliders" into existence, etc. exists on a fundamentally different level. "There are several reasons we might interest ourselves in what it is that the people in this audience were doing, or thought they were doing, or were trying to do, when they seated themselves in that way. One is that we may not like the result: we prefer they all be in the first twenty-four rows, not the last twenty-four, or distributed over the whole auditorium. If we want to change the pattern with a minimum of organization, interfering as little as possible with the preferences of the audience, we need to know whether we can subtly change their incentives or their perceptions of the auditorium itself, so that they will 'voluntarily' choose a better seating pattern. Before we do any such thing we ought to know whether the audience itself likes the seating arrangement that it chose organically, and whether the fact that they chose their seats as they did is evidence that they must be satisfied with the final outcome. A second reason for interest is that there may be something about this process that reminds us of other situations in which people locate themselves voluntarily in some pattern that does not possess evident advantages even for the people who by their own choices form the pattern." "There are easy cases, of course, in which an aggregate is merely an extrapolation from the individual. For example, if we know that every driver, on his own, turns his car's lights on at sundown, we can guess that, from a helicopter's point of view, we shall see all the car lights in a local area going on at about the same time. We could even get our compass bearings by reflecting that the cascade of lights will flow westward as the dusk settles. But if most people turn their lights on when some fraction of the oncoming cars already have their lights on, we'll get a different picture from our helicopter. In this case, drivers are responding to each other's behavior and influencing each other's behavior. People are responding to an environment that consists of other people responding to their environment, which consists of people responding to an environment of people's responses. Sometimes the dynamics are sequential: if your lights induce me to turn mine on, mine may induce someone else but not you. Sometimes the dynamics are reciprocal: hearing your car horn [...in anger, or to celebrate something...], I honk mine, thus encouraging you to honk more insistently. These situations, in which people's behavior or people's choices depend on the behavior or the choices of other people, are the ones that usually don't permit any simple summation or extrapolation to the aggregates. To make that connection, we usually have to look at the system of interaction between individuals and their environment, that is, between individuals and other individuals or between individuals and the collectivity." The point made by Schelling is sometimes arrived at intuitively by interactive designers, especially those working in multi-user gaming environments and artificial intelligence. Truly, the modes of thinking between "economic thinkers" and "design thinkers" are very similar indeed. The question I keep asking myself is why professionals in each field are so unlikely to be familiar with the work or mindset of professionals in the other field. How many designers are truly aware of the economist's mindset? Many would never be caught dead talking to "boring" economists. And, somehow, it seems many economists have an equal aversion to communicate with designers. Those intrinsic properties of the individual cells (of persons, in other words) are the cornerstone of the nation, and it is through their interactions with the other cells (Friedrich Hayek might have called them "praxeological" or "catallactic" exchanges), that we bring about the meta-structure, the spontaneous emergent intelligence that is the nation. The lesson for aspiring nation designers is clear: it is essential to have a deep understanding both of the rules that individual cells on the grid live by and communicate through, and of the odd and unintended consequences that changing interaction rules, or any of the variables, has on the system. Indeed, nothing can be started without this understanding because, unlike the programmer in John Conway's Game of Life - who at least gets to control the rule that turns each square on or off - the nation designer doesn't actually get to "enforce" the rule that each individual cell, each human being in the system, lives by. Based on the coercive power of the state which has been exercised throughout history, we may feel that we can lay down the law and enforce the rules, but any such system will eventually implode through the sheer pressure of the superorganism's reaction to this misdirected force of coercion. Revolutions and economic collapses are quick to follow, until the nation designer realises that he must work with the grain, with the intrinsic properties of the individual cell. Coercion is not even bad nation design, it's the opposite of nation design. The good news for designers is that we have started from the right place: it is the individual user's experience we design most of our work for anyway. Be it in product design or architecture, no designer has ever relied on individual user coercion to make a design work, or even to achieve a certain result from the user that would provide a better outcome for all users. Apple already designs its iPhone interface so that the individual user might experience what Csikszentmihalyi called 'flow'. What this approach to interface design has in common with most economic incentive-based models is the fact that users' engagement is always voluntary. Both economic models and interface designs are essentially user-centric because they have to be so, the individual user never has to do anything that doesn't come naturally to him. Voluntary engagement is the starting point from which to apply our design skills in designing the system of interaction between the individual users and other individual users, and between the individual users and the nation's institutions, in order to arrive at a nation design that is both intelligent and essentially human. Today is 14 July, Bastille Day in France. Every town and city is getting ready for fireworks and public celebrations. Interestingly, this year, the day after Bastille Day is tax freedom day in France. No fireworks or public celebrations, but an interesting subject to ponder about while recovering from a hangover. Tax Freedom Day: the day that separates the income you've earned this year which is confiscated by the tax man, from the income which you get to keep for yourself. Much has been written about the Aztecs' custom of sacrificing something or someone dear to them to the gods, hoping in return for sufficient crops to last them through the winter season. Taxes are a sacrifice of similar proportions today, with perhaps equally dubious outcomes: Europeans, every year, sacrifice six months of full-time work to the state, hoping in return for a roof over their head and food in their belly during the winter season of their lives. As for actual human sacrifice, no Aztec gods ever demanded it in such quantities as the various states of Europe did throughout the twentieth century. Millions of their victims' names cover the monuments of our city squares. The 'morts pour la patrie' - those who 'died for the fatherland' - are actually the lucky ones: the unlucky ones were deported, gassed to death and turned into soap bars. Let's see if we can improve this depressing picture. Let's re-frame the interaction between the nation and the citizen, by looking at the role of the government as that of a nation-services provider. The first thing to strike us is fundamental: service providers do not normally kill or threaten to kill their customers, nor do they rely on coercion to get customers to keep on buying their services regardless of the quality of service provided. Customers are not forced to part with their money to purchase anyone's goods or services. There is no "buy this, or else...". Instead, designers and product developers in competing companies have to make a great deal of effort to offer something different and better to attract customers. The interaction with the customer is done on a voluntary basis, making customers much more powerful than citizens. Your phone service provider doesn't claim the right to send you to fight a war against other phone providers, killing and maiming their customers - whom you have no personal quarrel with - or being killed by them instead. Your phone service provider doesn't force you to pay more because your neighbour cannot afford the service. You are free to pay for your neighbour if you feel it is your moral duty to support him using you own, personal set of values and human compassion. Your phone service provider doesn't send you to jail if you judge the price or service to represent bad value for money and decide to spend your money on other providers, or even other goods and services instead. The same cannot be said about most state institutions. Let's consider, as an example, the famous case of Rosa Parks, the American black civil rights heroine who wouldn't sit in the back of the bus. In a free market, Rosa Parks would simply have been an alternative customer. Bus companies would perhaps have labelled her a "niche market", and if the bus she was on prohibited her to sit anywhere but the back, another bus company would surely have seen the opportunity to cater for her segment of the market and advertised the fact that, on their buses, black people can sit anywhere they like. Problem solved. Instead, Rosa Parks faced the inflexibility of a state which claimed the rules of interaction to be just fine as they were and, rather than seeking to improve the service it offered to the citizen, was so opposed to the idea of change that it sent policemen and soldiers to stop it from happening. This is not that surprising: the state is, after all, a monopoly. There is no competition to it within its geographical space. The natural outcome of this state of affairs is that perfectly decent people have to go on hunger strikes, fight the police, be labelled criminals and even die before change can be effected. You see, change always comes from the outside: it arises when an external factor is applied to a balanced system, making it lose its balance and then to find a new equilibrium point that takes the new factor into account. If a geographical monopoly status exists, as it currently does in the nation services sector, then change can only really occur when customers vote with their feet, or when they apply political force. The external factors that would give citizens the power of customers simply do not exist. So, change and improvement cannot happen at anywhere near the pace we are used to seeing in other areas of our lives. Let me be clear, corporations are by themselves just as keen as the state to maintain a status quo that is favourable to them. It's just that external factors are applied to their balance by other corporations that are just as keen to find new customers. In a free market, you just change providers. Customers who are unhappy with their mobile phone service will just switch over to another provider. Furthermore, where no good provider exists at a particular price, any customer can try to become a provider himself. As a result of this, a new provider will quickly arrive on the market, constantly offering better goods and services at lower prices to the consumer. The moral case is even stronger: the free market model of competing nation-service providers is the only space today that makes possible, for example, the concept of civil disobedience, Gandhi's theory of individual non-participation with evil. Customers are, by definition, free not to participate in whatever project they consider evil and take their custom to a competitor. Every sector of our lives is constantly being designed and re-designed, analysed and modified, rethought and relaunched, sampled and optimised for personal preferences, cultural bias and local prices. Every sector, except the state. Everything you see around you - from fragrances to furniture, from tableware to technology - has been designed to make you, the individual user, happy. Where it has failed to do so, an opportunity exists for new designers to improve things. This is true for every sector, except the state. As a result, the state has become an old and sclerotic machine that is constantly on the verge of losing its raison d'être in the modern age. Rather than lament this state of affairs, let us treat it as an opportunity. In fact, it may be the greatest opportunity designers have ever encountered. Beyond democracy: designing human interaction systems. Every 5 years, car companies would send flyers out and be allocated ad space on TV channels to advocate the reason why we should all drive, say, a blue Ford Mondeo saloon car, a red Ferrari 2-seater, a grey Renault people carrier or a green Toyota Prius hybrid vehicle. Representatives of the different car brands would canvas from door to door and organise rallies where, rather than showing actual cars, they would promise all sorts of features to enthusiastic, banner-waving supporters. Then, we would all vote according to our own strongly held ideological position, following which we would all - young and old, families and single men, green activists and climate-change deniers - have to drive the same car for the next 5 years. Importantly, it would be an all-or-nothing manifesto that we would vote on, which would coerce the malcontents into 5 years of dissatisfaction and disenfranchisement. So, now that we've highlighted the absurdity, let's look at how we can make serious improvement in the process we currently use in the political sectors. Why hold elections every 5 years? Why deny the opportunities for significant citizen feedback for such a long period of time, in an age when other organisations rely on near-instant Web 2.0 feedback as a way to sustain constant dialogue with their customers? Why be satisfied with the idea that a number of people, up to 50%, will be frustrated with the service they're getting for the next 5 years, in an age when management in other sectors panic if the level of customer dissatisfaction reaches double-digit numbers? The whole concept itself of "taking turns" every 5 years or so is something that inhibits the system's design evolution. This is obvious when you look at other sectors where evolution happens at a much faster rate. You don't see Apple and Microsoft taking turns every 5 years over who gets to run the operating system on your computer. You don't see Google and Bing taking turns every 5 years over who gets to provide you with internet search results. 1. Could it be that democracy is actually little more than a stepping-stone, a simple evolutionary step towards a more citizen-empowering interaction system, rather than the be-all-and-end-all perfect system our institutions claim it to be? 2. Is it possible that our nation institutions might have turned democracy into a dogma and thereby locked it out of its own evolution course? Nationcrafting starts with the realisation that there is room not just for some improvement, but for change of a similar size and depth as Web 2.0 has effected on the dynamics of many sectors of industry, where it changes not only what is produced and consumed, but how it is produced, how it is consumed, how it is paid for and by whom. The important point to realise, however, is that change in those sectors was not effected from the inside. It's not as if technological change was adopted by the already existing players to evolve by their own accord. Rather, technology enabled new players to enter a sector, offering new products and services in a new, easier, cheaper or better way. The existence of these new players is what triggered the old players to either change or become obsolete, to evolve or wither away. For example, none of the established providers in the music industry came up with a product like iTunes, Apple did (and the change itself was, of course, triggered by Napster). A perfect example of Buckminster Fuller's assertion that "to change something, design a new model that makes the old model obsolete". The existing players in the music sector had a system of distribution that was oriented towards the distribution of discs containing music, rather than the distribution of music itself. It took an outsider like Apple to see that what users really wanted was the music, and to then bypass the entire disc distribution system (CD printing factories, high street retailers, etc.) by using that data distribution system users already had access to by virtue of being connected to the internet. Similarly, you could say that the current system of, say, security distribution is oriented towards the distribution of police forces that provide citizen security, rather than the distribution of security itself. It isn't the case that the old state institutions will change from the inside. Rather, it'll take outsiders to realise that police forces are just the carriers of security (i.e. they are not security itself) and, just like Apple, the outsiders will then bypass the entire security carrier distribution system to provide security directly to citizens in another way. So, you see, there is no need for "nationcraftism", for a fight, for an activist political design movement, for a revolution that attempts to change currently existing states from the inside. Rather, new nation-like institutions will be formed by innovative organisations and entrepreneurs, which will provide nation services in a new, easier, cheaper or better way. More importantly, they will offer these services in the same way all companies offer goods and services to their customers: by offering value for money, rather than by coercion. It is likely that, in the beginning at least, these new nation-services providers will exist alongside existing states, not even labelling themselves as states, which means they will not enter the existing paradigm of conflict that arises whenever groups of people "declare independence" or otherwise assert their autonomy. For example, we currently have online collective bargaining companies that create a market pressure on providers to lower their prices in exchange for a significant amount of online users who are interested in their particular product. We also currently have price comparison websites that search a variety of airlines' databases for the best price on a ticket. We have all sorts of online entities interfacing between customers and companies, who make it their business to get you and me a better deal. So, it's not inconceivable that there should soon be an online entity interfacing between citizens and existing states, searching for the best country a customer should be resident in, or domiciled in, what the costs are, what the time-implications are (e.g. how many months you have to live there to benefit from this or that policy), what would be involved in acquiring citizenship or residence and what the costs and benefits would be. Offline agencies currently offer this kind of service for the very rich. However, given that much of the added value of such agencies is in knowledge and data processing, it's easy to see how the service could be extended to a broader base of customers. The service could manage customers' identity data and remind them of the things to do in order to get their paperwork sorted in time, or do much of the paperwork itself. It might, for example, be that customers need to have been in the country for a while before they can apply for residence, or that they can't be in the country for longer than a particular amount of time to benefit from a tax break, etc. It might even be the case that the company takes care of all paperwork between the customer and embassies, city councils, tax offices, like a one-stop-shop for everything citizen-related. Getting a significant amount of customers would reduce the cost of services which are, today, only accessible to the wealthy few. Then, when a sufficiently large number of people see that joining these new institutions provides more value for money than the taxes they pay to their state institutions, change will occur by itself: a mixture of competition and cooperation between these new breeds of service providers and the existing states will trigger the latter to either evolve or wither away. Once this kind of evolution starts happening, the opportunity will exist for new nation-service providers to form and attract citizen-customers with a better deal. 1. On new territory being created, for example, by seasteading. 2. On territory leased from existing states to a new provider, in a similar way to the lease that used to exist between the UK and China with respect to Hong Kong before 1997. Charter cities, in other words. Some notes on the former: the interesting thing, here, is that no claim would be made on the seabed underneath the seasteads, so the organisational infrastructure is what seasteading customers would buy into (or get out from if they're unhappy with it) rather than anything physical like land. This sets them quite apart from existing states, which all rely on the premise that geography and societal organisation are somehow interconnected. The other interesting thing is that seasteading communities could exist perfectly harmoniously alongside existing states, simply by having each individual seastead sail under a different flag of convenience. The 'hive' that is the group of seasteads - along with its organisational infrastructure - would be one thing, but each individual seastead would still be a part of an existing state, choosing whichever is most convenient. Some notes on the latter: this would probably perform best in a city-nation model to reduce the level of management that would exist between citizen customer and service provider. Once a city-nation has been developed, as a "working prototype", we could start the replication of this working model in various other locations, both from franchise providers (today, fast food restaurants and coffee shops apply this model of business expansion very well) as well as from competitors studying the prototype and creating their own city-nation systems. These two ways are not exclusive: they could easily both develop at the same time. The aim is to increase choice, to create a better likelihood of matching the desires of each individual customer. There will be mainstream nation-services providers, and more niche ones. However, if you think about it a little deeper, it becomes clear that both seasteading and charter cities have a weakness, which is that they still assume a correlation is necessary between geography and nation services. Both ways essentially still adopt the idea that "if you don't like it here, you're free to leave", as if there were some magic, nature-imposed connection between where you are and what laws apply to you. There is no reason why, when a person steps over a geographical line, he should suddenly not be allowed to do things he was allowed to do just a minute earlier on the other side of the line. This is the reason why, in the end, the meta-service providers or agencies - interfacing between citizens and city-nations as well as existing states – will prevail, their "lightness" being their main asset. Seasteading and charter cities will be a great step, and they will be successful, but they are just steps in between where we are now and where we will be, for the simple reason that, ultimately, a nation will be no different to a cellphone service provider. The conclusion of this essay is that, to generate an improvement in the nation-services sector, it is not useful or even necessary to take a political stand against an existing state system, to be an activist. You don't need "activist" architects to come up with new, improved houses. You don't need "activist" car designers to come up with new, improved cars. In the words of Buckminster Fuller, "you never change things by fighting the existing reality. To change something, design a new model that makes the existing model obsolete." The most effective way to change a bad company is not to fight it, nor is it to "join it and try to change it from the inside". The most effective way is to launch - or promote an existing - competing company providing a better service at a lower price. 1. increase citizens' awareness of their state as a service provider in a market of service providers. 2. increase citizens' ability to choose between the various existing nation-service providers, the way airline price comparison websites have enabled travellers to instantly compare the deals offered by various airlines. 3. design a new kind of nation-services provider, using an alternative channel to the market in the same way that a software company like Apple became a music distributor with iTunes. All of these will get a "free market of nations" or "competing governments" system underway, which will itself trigger an evolution in citizen-customer interactions and services from the primitive state they are today into something more in line with the interactions and services we are used to in other sectors. I'll start this essay with a little bit of info about the methods used to make software applications, such as the browser you're using to read this essay or the operating system that runs your computer. I'll then look into the possibility of applying those methods into the applications we use to interact with each other i.e our systems of law. Software companies regularly go through processes during which an entire application is re-built from the ground up. Well, applications are constantly renewed and improved to keep up with the market, adding new functionalities, simplifying some elements, making features more powerful or just more user-friendly. Software companies have a process for this, which typically involves taking user feedback, compiling bug-reports and inventing new ways of doing things that eventually end up forming the basis of newer versions of the software. In order to do this, bits of programming code, or code patches, are attached to the main structure of the program. As more and more code patches are added to the structure, after a while the program ends up looking, well, like a patchwork: a mesh of different things coded up by different programmers in different teams. The whole thing becomes harder and harder to improve: bits of code start conflicting with other bits of code, which then calls for debugging and a near-endless process of amending, correcting and re-writing code. The increasing complexity of this type of process is one of the reasons why software companies are so interested in programs that learn how to program other programs. Code writing code. Aside from this, sometimes technological evolutions in the wider context (availability of new tools, etc.) become real game-changers, which leads to fundamental changes in the way things are done. At that point, instead of patching and re-patching bugs, the software company will simply decide to rewrite the whole program from the ground up, with all the new functionality as a part of the new technical specification. This, in itself, would be a sufficient reason to at least evaluate the idea of regularly rebuilding from the ground up the code that we use to interact with each other. After all, what are laws if not simply lines of code copied and pasted from previous versions, amended as and when a new "bug" is discovered in human-to-human interaction? Now, here's an interesting evolution on the concept: code is essentially "ideas made stuff". This point is important, so I'll briefly explain an aspect of the ideas world that profoundly affects the nature of code as "ideas made stuff". Finally, the ideas world is also much more "liquid" than the material world. More like water than objects, ideas just flow. Or, better put, if you try to keep them in a contained space, they just leak. Once an idea is out there, it's impossible to return it back to its original owner. Combined with its effortless multiplication, it therefore only needs to be shared between a few more people for it to become impossible to control. 1. You can try to tightly control the flow and multiplication of something whose nature it is to flow and multiply. 2. You can design your business to use the element's intrinsic properties the way a sailboat uses the wind to go forward, letting the wind do the work. This latter way of thinking about it is the driving force behind open-source programming: opening up the source code of your software to the world, literally letting thousands of programmers into the container to look at the code, to debug it where they can and improve it at breathtaking speed, through the sheer number of brains devoted to creating something new and better. In this mindset, the software company's production team takes on the role of editor or coordinator, to ensure that the bigger picture is not lost, but each programmer is entirely within his or her own right to take whatever code they find useful and modify it to create something else that is useful to them. What's interesting about this phenomenon is that it turns a whole variety of tools into a constantly evolving pool of tools, each one having the potential to be very precise and yet each one being also highly malleable. The source code to an encryption system taken from an online shopping cart is re-used to encrypt the anonymous leaking of content to a political site whose own image-sharing tool is then re-used to create a group-edited visual guide that shows you how to do anything from tying a Windsor knot to changing the spark plugs in your car. Ideas, everywhere, made stuff. What's also interesting about open-source code is that it perfectly follows the laws of the ideas world and yet, unlike other ideas or information, we are much more able to visualise its connection to the material world: many man-made things around you aren't just made better or easier with shared code, an increasing number of them simply wouldn't exist without shared code. You facebook someone to meet up, you Google the place you're going to meet and call them on their cellphone to ask which end of the street they are once you get there. Code is the perfect example of the enormous potential of shared ideas. Under 'normal' circumstances, you need capital goods to increase production from digging one hole per week with a spade to digging a thousand holes per week with a bulldozer. Code, however, is like a thousand million bulldozers for the price of one. It creates infinite wealth, for everyone, with only a minimal amount of capital required: just enough capital to produce just one. Think about it: you and I are not that different from our ancestors in 50,000 BC, but it took just one person showing another person how to cook, hunt or farm, for the space between us - the space of shared ideas - to create leverage and augment the reach of our brains beyond the space that exists between our ears. Code expands this leverage not just to a higher number, but to a higher gear, i.e. to a different category of higher number. Using our earlier apple pie analogy, this is apple pies squared. Because of the elusive sharing properties of ideas, and the difficulty in measuring their impact, we tend to forget to attach economic value to them. Ideas are often thought of as somehow inferior to 'real' things like oranges, cars and televisions. This is odd, if you consider that all the wealth you see around you, from oranges to cars and televisions, is the product of shared ideas and knowledge. But it's understandable, given that there is not much to ideas that is physically perceivable. They are only perceived after they are materialised, after they are incarnated, as it were, in the objects we perceive around us. Margaret Thatcher once said that Japan was living proof that the greatest resource of any nation was its people. She was almost right: the greatest resource of any nation is its people's shared ideas and the ease with which any of its people can partake in the sharing of ideas, thus turning them into material wealth. Economically speaking, this ability to share ideas and knowledge will define the 21st century through and through: we are the first generation of humans to have nearly all of human knowledge available at our finger tips. Everything - from orange growing, to car designing, to television repairing, to mouse cloning and, ultimately, the science to improve our own selves - is all there, entirely free. We can add to it, or take it to create something that is useful to us. It's open-source. More importantly, over the coming century, we will see a categorical difference in service quality between open source-minded nations and statist nations. This difference will dwarf the difference we would have once seen between fire-making and non-fire-making tribes of the past. Why will the difference be so great? Because the one sector in which open-source code will make a substantial difference, is the code that dictates the interaction between people themselves. As mentioned earlier in this essay: what is true for programming code holds at least some truth for the code that systematises human interaction i.e. our constitutions, our laws, our nation's institutions, all the methods we use for the smooth interaction between users and other users, and between users and the nation. Copy and paste the code, edit it, improve it to suit your needs, re-launch it. We are taught in the press, in our schools and universities, that democracy is the be all and end all of political evolution. But even the most democratic states are just like those software companies that duly take note of users' bug reports and occasionally rewrite whole sections of their programming code to release a new version, unable or unwilling to make the jump towards the open-source way of developing code. The key difference between software companies and states is the lack of competition among the latter for citizen-customers. States are geographical monopolies, they have no incentive to go open-source, to take the next step. Their institutions are more interested in asserting the superiority of democracy than in exploring the possibility that it might just be a stepping stone, that we might just be one step away from something categorically superior. Over the coming century, however, the economic impact of software companies - those producers of "ideas made stuff" - will be so big that states as we define them today will simply become irrelevant as units of economic production, trade and consumption. One by one, industrial sectors are being transformed at their core by software companies. Who is the biggest music distributor in the world today? A software company. Who runs the biggest TV channel in the world today? A software company. Who will be tomorrow's biggest health service providers, law providers, housing providers, food providers, civil-security providers, money providers?... Software companies. At that point, the idea of nations as service providers competing for citizen-customers will just be clear as water. Once we have competing nation-service providers, nations will likely go through the same evolutionary steps that software companies went through over the last 30 years. Just as software companies have increasingly had to make a choice between tightly controlling their code or using the element's intrinsic properties to improve their products and services, nations will increasingly be faced with a choice between tightly controlling the code we use to interact with each other, or using the element's intrinsic properties to improve their products and services. Law is code, and the best code is open-source code. R. Buckminster Fuller was a designer, inventor and futurist born in 1895. One of the concepts he is most famous for is the term "ephemeralisation". Put simply, ephemeralisation is the ability of technological advancement to do more and more with less and less, until eventually you can do everything with nothing. One of the most illustrative examples Fuller gives is the following: in the 16th century, it took Magellan two years to circumvent the planet in a wooden ship. Three centuries later, a steamboat could do the same job in two months. One century later, early planes could do it in two weeks. Half a century later, jet planes could do it in two days. Today, space capsules can do it in two hours. The main point to understand about ephemeralisation is that there is an acceleration taking place: the rate of doing-more-with-less-ness increases over time, as resources saved can be re-input into the equation to perform better than they did before, thus saving even more resources, which get to be re-input, etc. In information technology, the phenomenon of ephemeralisation is called Moore's Law, which establishes that you get a doubling of computer power at half the cost every two years. Sometimes you see a slowing down in the acceleration curve, but this is then compensated for by more impactful or paradigm shifting inventions and discoveries. What's interesting about Moore's Law is that it produces an effect of ephemeralisation in every other sector you can think of once that sector has been exposed to information technology. As soon as computing paradigms, high resolution scanning and processing of information are applied to, say, medicine or telecoms, an acceleration in evolution takes place in those sectors that enables projects previously scheduled to last half a century to be completed in under a decade. The Human Genome project is a perfect example of this. We've discussed the impact computing has had on telecoms, not just making what there is much better and faster, but taking the entire sector up to a level unthinkable by the previous generation. We now need to face the fact that the most unevolved and sclerotic areas of our human interaction system are the areas still run by the state. Whether they are dictatorships, oligarchies or democracies, the beasts are just too big to turn around when the human culture around them is evolving at an accelerating pace. It's time to let go of the methods we've been clinging on to for the past few thousand years and let the sectors that matter most to us evolve. Health doesn't need to be run by the state to ensure that some of the deadliest diseases known today are added to the list of long forgotten ailments, all for the price of a couple of aspirin tablets. Health is about knowledge, i.e. information, first and foremost. When Watson 2.0 becomes available to every person with a cellphone, patients will be on an equal footing with doctors when it comes to identifying symptoms and cures, while 3D printing will enable them to print their own pharmaceuticals at home. As we have seen in areas such as ophthalmology, where IT has turned the process of laser eye surgery into a routine operation, the cost of surgery is dropping like a stone in those sectors that are least interfered with. Stemcell research is slowly freeing itself from the weight governments have put on it. When stemcell research brings a simple solution to problems like tooth decay, the brainpower of thousands of intelligent dentists will become available for much greater medical purposes than the fixing of teeth. Given that today's iPhones are a million times more powerful and a million times smaller than computers were 40 years ago, it is quite likely that nano-robots the size of bloodcells will be doing a better job than our own cells within 2 decades. At that point, health maintenance and augmentation will follow a similar pattern of business as software programming does today i.e. health is code. This will mean that the most complex surgical operations can be done for a minute fraction of the cost they are today, releasing the capital - which is currently diverted by millions of people towards their medical insurance - to work on greater purposes. Housing doesn't need to be subsidised by the state to become affordable and high quality. If anything, it's the subsidies and price and supply controls enforced by the state that have impeded this sector to evolve. In an age when every teenager walks around with an iPhone with more power than NASA had 40 years ago, it is an anachronism that a man should still spend a quarter of his life paying for housing technology. Still, we rejoice at the drop in the prices of our laptops and iPhones, but lament the similar, natural evolution towards lower prices in housing, for fear our houses will be "worth less" than the mortgage we haven't finished paying back. Therefore, the transformation in this sector will have to come from a new generation that is not yet hooked onto this system, for whom a home is a technology for living in that shouldn't take over half of a hard earned salary every month. Once a home technology loan comes within the range of, say, a car loan, the drops in prices will become acceptable and even desirable, just as they are for all other technology-driven goods and services. Education doesn't need to be run by the state to be available to all. Education, of all sectors, is primarily about the processing of information. We learn, or acquire information and meta-information (information structures), and we learn to learn, so as to enable us to expand our information structures as and when we need (or want) to. Very few sectors are as ready for an IT revolution, Moore's Law and ephemeralisation as the education sector is today. Yet we cling on to schools with teachers and classrooms: the same system used a thousand years ago, a system that takes nearly two decades to educate a young human, despite becoming increasingly aware that, in two decades, the next generation will be doing things in this world whose existence we can hardly even imagine today. The reason we do this is that there is no start-up sector in education, there are no "two guys in a garage" working out the next big thing in education. There is no start-up sector in education because the public education's quasi-monopoly status is enshrined in law. There are non-state schools, of course, but they're still schools, and they're still teaching state-approved methods and curricula. These, and many other sectors, are currently operated by the state based on the assumption that all citizens should have access to them regardless of their personal wealth. This is, of course, a wonderful motive. But it requires much better methods of allocation of resources than will ever be possible with the blunt tools of government. It requires doing much more with much less, using systems that aren't just OK today, but that are open to evolve alongside the evolution of everything else within the human interaction system. In other words, it requires ephemeralisation. This essay was originally going to be part of the essay "Ephemeralising nation-services", because the main point in it is that money doesn't need to be created and managed by government to act as a good medium of exchange or store of value. Which means we stand a good chance, as designers, to create - or at least to rediscover - something better than what is out there today. The first argument for this is quite simple: the quality of the products in any sector is always and everywhere jeopardised when the price and supply of those products are dictated by a committee rather than by the market - and money is no different. Our money, today, finds itself in the same rotten state that agricultural food products were in during the Soviet era, whose price, supply and quality were also managed by a small group of know-it-alls, and whose notable absence in the stores of the Soviet Union led to mass starvation every few years. If money were our only food, we'd all be starving now. Money is even further jeopardised when the committee determining its price, supply and quality doesn't even aim to make these factors a top priority in their own right, and instead tries to bend the product's properties in order to fulfil other (political) agendas e.g. aiming towards full employment, boosting a nation's exports, bailing out failed organisations, etc. Whether these agendas are valid is not the issue here, the issue is that no product will remain good or even usable for very long if the company managing it doesn't care about its properties. The second argument is a little deeper: a medium of exchange is, essentially, information technology. It is a technology that processes information about the comparative value of everything. It's what allows you to compare apples and oranges, which is very useful if you're selling apples and want to buy oranges. It also contains, within its variations and fluctuations, meta-information that allows the human interaction system to organise resources where and when they are most needed. Its flow should be as free as the free flow of any other information. The idea that a small central body should control this information undermines not only the quality of the money product itself - the information technology that it is - but also the free flow of all products and services that are bought and sold with it, which depend on this information and the meta-information contained in prices in order to be allocated efficiently. The third argument is deeper still: there is a fundamental paradox in the way government has led us to think about money, which has led to a major flaw in its design as a product. The paradox is that we expect one and the same thing – money - to perform two critically different - and in many ways opposite - functions: medium of exchange and store of value. This is, today, one of the first things we learn in economics class: money is a medium of exchange and a store of value. The idea that we might have to separate these two functionalities into two different money products has died out in late 20th century western culture, as we have come to take for granted the idea that money is something created and managed by government. However, in countries where people don't trust their governments so much, there is still a tendency to separate the two functions into two different monies. In many countries of Latin America, for example, people will use their country's currency to buy their food or pay their bills, and use another, stronger currency to save in. Shops won't necessarily accept this other currency, but they'll be happy to change it into the local currency at whatever the going rate is, and carry on the transaction from there. In India and many Arab countries, the harder currency is replaced with gold. In China before the Communist revolution, most people saved with silver and, today, do so with gold. People do this to avoid the high rates of inflation and devaluations that usually follow bad management of the national currency as it is constantly printed and reprinted to meet the expenses and unforeseen consequences of yet another badly thought-out state program. It's easy to see why this paradox, this confusion of two functionalities, might have happened. A medium of exchange must store value while its user is between the two transactions that define it as a medium: having sold something and not yet bought something else with the money. Conversely, a store of value must, by definition, be something that will be accepted by the party selling a product the user wants to purchase in the future. It therefore acts as a medium of exchange over the long term. And yet, even though the two functionalities must exist within one item, they cannot co-exist equally within the same item, because they are forces pulling in different directions. As a result, individuals who need it to perform better in one way than the other enter into conflict with individuals who need it to perform the other way. A store of value performs best when it can lie still, sometimes for many years at a time. The longer it can do this and be used later on no matter the circumstances, the better it is at this function. A medium of exchange, on the other hand, acts at optimal level when it moves very fast and fluidly through our human interaction system. A note travels from buyer to seller, from buyer to seller, from buyer to seller. The more it does this, the more it is validated in its function as medium of exchange, as it has no drag on the free flow of the market trading through it. Now, when a medium of exchange's purchasing power decreases (because more of it has been created than the value in the real world which it represents), its capacity as a store of value decreases like a leaky bucket that loses some of its water as it is transported from one place to another. Everyone thinks "this bucket is leaking water, I'd better trade it for something else before it runs out of water". What happens then is that its velocity increases: the bucket gets passed on more and more often as fewer people want to be left with it and would rather hold something real or investworthy in their hands instead. It changes hands more and more often and becomes, as it were, more slippery. In other words, it becomes more used as a medium of exchange. Gresham's Law: bad money drives out good money. The badder the money, the more it is used as a medium of exchange and the less it is used as a store of value. It isn't that good money stops being used, it's that it ends up being used as store of value, while the bad money is used as currency. The leaky buckets are traded faster, the watertight buckets are kept in storage with their water and only get used in emergencies. The watertight buckets don't stop being used, their use just changes from medium of exchange to store of value. So, we see here that there are two opposing functionalities for money when it acts as both medium of exchange and store of value: when it becomes bad at one job, it automatically becomes better at the other. Ludwig von Mises is one of the few economists who analysed this difference between medium of exchange and store of value. He called them "primary" and "secondary" mediums of exchange. You could compare the functionality of each medium of exchange to the gears you use on a car. You don't pull out of your driveway in fifth gear, and you don't drive on the motorway in first. We established earlier that the best store of value is the one that can lie still for many years and be accepted for transaction. It must be able to do this, whatever the circumstances should be when it is taken out of its state of hibernation. It must therefore even be able to outlast the political system itself, as it may end up being used for emergencies exactly at a time when a political system is collapsing or transitioning. It is therefore logic to conclude that the best store of value cannot ever be part of the list of products a government is able to manage, since this store of value must continue to exist when the political system the government represents ceases to exist. We have also established that an object which acts as both medium of exchange and store of value cannot perform both functions well, because they are opposing forces. Medium of exchange drives out store of value. First of all, producing an accepted medium of exchange puts one in a position somewhat similar to that of an alchemist who has just discovered how to create gold out of a cheap metal. In a political system - a system which, unlike free trade, functions not by persuading the individual but by coercing the individual - this irremediably leads to a misallocation of resources, which leads to unintended consequences, which are then "remedied" by further misallocation of resources, which have their own unintended consequences, etc. In a free system of exchange, on the other hand, the alchemist's hands are tied by the fact that people may use another money product instead, produced by other alchemists. Secondly, when more currency is being produced without a commensurate increase in the value of real goods being produced, the devaluation of the currency doesn't occur equally across the system. Its effect on prices is amplified the further one stands away from the source, the way a whip's impact is stronger the further away the whipping tip is from the whipping master's hand. In other words, when the issuer of the currency spends it, it has yet to devalue, when the first recipient of the issuer's currency spends it, it may still be close to its original value because the market has no significant new information about prices. As the money is spent by a wider and wider set of people, its value rapidly decreases, until the final people in the wave, those with very little leverage in the decision-making process, receive the fully devalued currency. Thus, inflation represents a transfer of wealth from those who are further from the political centre to those who are closest to it. In a free market of currencies, this is counteracted by the fact that people can simply refuse a currency when they sell their products and use another one instead. Finally, currency isn't just a product like any other product, it is by definition the most marketable one. It is the thing that is sold for everything that is bought, and the thing that is bought for everything that is sold. It is therefore most subject to the aggregate information contained within the market and performs least well in a non-market environment. The calculation that tells you how much currency the system will need and how it values everything else in the human interaction system cannot be done better by a small committee than by an entire nation buying and selling products and services through it. So, the case is made that a medium of exchange needs to be a product of the free market, rather than something imposed on the free market. It needs to simply be the free market's most marketable product, the product you're happy to trade your other products for because you know you can always trade it back in to buy what you really wanted. Obviously, the biggest attribute it can have in that regard is its network value. Network value is value that is determined by the number of people who are also in possession of a product. For example, an email address is useless if there's nobody else you know with an email address. Who are you going to email? An email becomes most useful when everyone in your network also has an email address. Now, if there is one thing we have witnessed over the last couple of decades, it's the formation of networks that transcend geography, that are nothing to do with the imaginary lines drawn out by states. It stands to reason, therefore, that as networks are created that transcend the geographical limits of the state, and as markets are formed that transcend the geographical limits of the state, so the opportunity opens up for the network value of certain highly marketable goods to increase, and therefore their marketability overall. Once we see media of exchange designed by competing agencies to correspond to these new network formations rather than the geographical limitations of state-created networks, we will see the same kind of evolution in our media of exchange as we have seen in other information technologies. "When a plant is just a seed, it has no idea that it's going to grow all these leaves. It has no idea that it's going to be this big thing made of wood. It has no idea that it's going to grow beautiful flowers. This is the state of humanity today: it has no idea. The transformations we go through were not planned by the previous generation."